Who Is This Workbook Designed For? What Does It Say on the Back Cover? "Change isn't easy, that's why we struggle with it. and we wouldn't need programs, rehabs, classes, workbooks, sponsors, psychologists, pastors, and support systems to help us through it!" "Recovery requires us to make major life changes...including changes in how we think and respond to life... our life in the past, the present, and the future." "Recovery requires hope and faith that things will get better as we get better." more and more the person we were designed to be." "Recovery often requires that we "step out of our comfort zone and take the steps necessary to change our life. in order for your life to change...for the better." one that brings peace amidst the chaos." "Sometimes we get so overwhelmed by our emotions that we’re in a state of emotional upheaval. We CAN’T THINK STRAIGHT. We may not even know how we’re feeling. We may feel like we’re going to fall apart or explode. We’re so full of feelings that our MIND IS RACING… thoughts are FLYING THROUGH our head. We’re so agitated, so full, so PRESSURED, and SO DESPERATE FOR RELIEF." it hurts us even more." "The Cycle of Suffering continues …until we STOP our destructive behaviors…or we are STOPPED. If we don’t stop on our own, Something Will Happen and we will be stopped! Something like being jailed, hospitalized, or otherwise institutionalized! Either we control ourselves or we WILL BE controlled by others!" life-changing. It’s Real Life. It’s truth… and it’ll lead to understandings that will help us on our journey to and through recovery. Understanding why we do the things we do and what we can do to Get Control of our Out-of-Control lifestyle…will give us the HOPE we need and the KNOWLEDGE and SKILLS to LIVE RECOVERY! The light at the end of this journey is THE PEACE that comes from understanding, healing, and recovery." "Some bad things happen just because bad things happen that we have NO control over. Other bad things happen because of something we have control over. Either we did something to cause a bad event or we didn’t do what was needed to prevent one!" "No matter what therapy program we do, the quality of our life comes down to WHAT WE DO in the Heat-of-the-Moment when our emotions are running hot! a lot of bad outcomes!" "We’ve got to Talk Ourselves THROUGH it…to GET THROUGH it." "We have to use Self-Talk to chill-out when we’re in the Heat-of-the-Moment." "We can no longer allow negative emotions to occupy space in our mind. We must evict them and fill the vacancy with positive tenants. That’s so we can have a new lease on life! “Cutting only gives me temporary relief from my problems. "Rational Mind doesn't buy into a “I’m a total screw-up. This is going to ruin everything. I can’t deal with it. I should kill myself.” mentality. Rational Mind CHALLENGES panic and negativity by looking at the situation in a calm, NON-EMOTIONAL, realistic, logical, and truthful manner." and we're focusing on ALL the things which suggest we may be that way. We're ignoring what Rational Mind tells us and we're viewing ourselves through the distorted lenses of Emotional Mind." A Recovery Goal is to come up with a wise plan of action RATHER THAN responding to a problem in an impulsive or destructive manner …or not responding at all. Wise Mind helps us to come up with a plan of action that best meets our emotional needs AND the demands and reality of the Big Picture of the Situation and Our Life. "To GET CONTROL of our life and our life outcomes, we must LEARN to be IN CONTROL of our emotions...INSTEAD OF ALLOWING our emotions to be IN CONTROL of us!" "We get into trouble when we keep running from our problems. We never really get passed them and they keep piling up. Our feelings get stuffed and we develop more and more issues, more and more problems, and more and more baggage to the extent we’re burdened with more than we FEEL we can bear." and we don’t move forward." to process the experience...and to GRADUALLY heal and recover." "We heal and finally Get Through our pain when we do our emotional work and whatever else is part of our healing process." Life-Enhancing Coping Tools to manage our distress and our life while we GO THROUGH difficult times. We use Wise Mind to problem solve, process, work through, and GET THROUGH...so we can go on with our life! "When we Go Through painful times...we must be willing to feel worse for awhile…so we can feel better down the road. We must be willing to tolerate distress and pain NOW so we can have a less painful future." "We generally decide to change when the pain of living like we’re living is MUCH GREATER than the pain of change." EVEN THOUGH what they would have to Go Through would be very painful! As we deal with our unresolved issues, our nightmares begin to change. When our issues are resolved, our nightmares quietly fade. Our nightmares are a gift. They tell us what we need to work on. Pain is like a nightmare, it screams, “DEAL WITH ME! DEAL WITH ME!” Pain is our CALL TO ACTION. It tells us there’s something wrong, that something is hurting us. Pain PUSHES US to deal with it… and it keeps bothering us until we do. When we deal with our pain, healing begins and our pain gradually lessens. Our psyche is designed to work in our behalf…to help us come to a place of peace… PEACE OF MIND." Welcome to the DBT-CBT website! This website contains a lot of information about the DBT-CBT workbook and program. It also contains actual pages from the workbook so you’ll be able to read parts of it and see some of the worksheets and charts. HOME - That's this page! 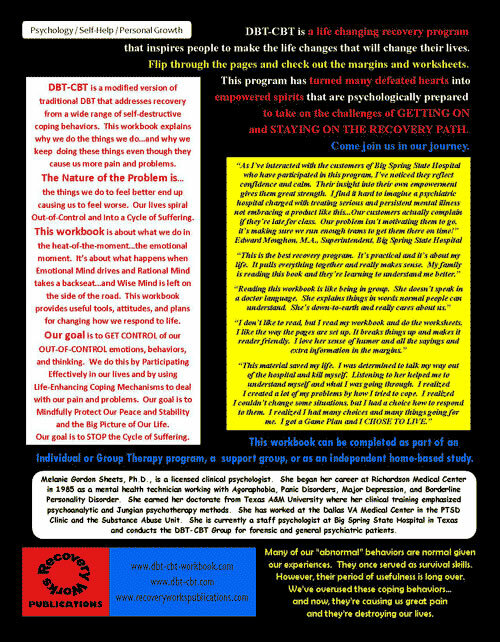 Here you'll get an overview of the DBT-CBT workbook and program...and information about how this site is set-up! FAQS - Find answers to some Frequently Asked Questions about this program and workbook. Actual text from the Introduction and the FAQS section of the workbook are included. EXCERPTS - See a “Table of Contents” which will show you some (but not all) of the topics discussed in the book. You’ll be able to read sections of the workbook, too. ABOUT THE AUTHOR - You’ll learn some things about Dr. Melanie Sheets. She even answers some questions about herself. SEMINARS AND PRESENTATIONS - Find out when and where Dr. Sheets is scheduled to speak on DBT-CBT. You’ll also find information about hosting a speaking engagement. ORDERING - This is where you can order the DBT-CBT workbook and other program materials. Quantity discounts are offered and bulk quantities of worksheets and charts are also available. FEEDBACK FORUM - Read some comments and reviews of the DBT-CBT program and workbook…and leave your own feedback! CONTACT US - Find out how to contact Recovery Works Publications. to avoid dealing with our pain and problems. They’re self-destructive because they cause us A LOT MORE pain and problems. When we make a habit of using these coping mechanisms, we end up losing many things that we cherish and value...things like relationships, jobs, kids, pets, housing, vehicles, possessions, trust, self-respect, our health and freedom...and more. Check out the list of Self-Destructive Coping Behaviors below. 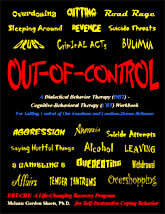 This list was adapted from Figure 1.C in the DBT-CBT workbook. How many of these things do you do? Most of us do MANY of these things...and we end up with a lot more problems to deal with! 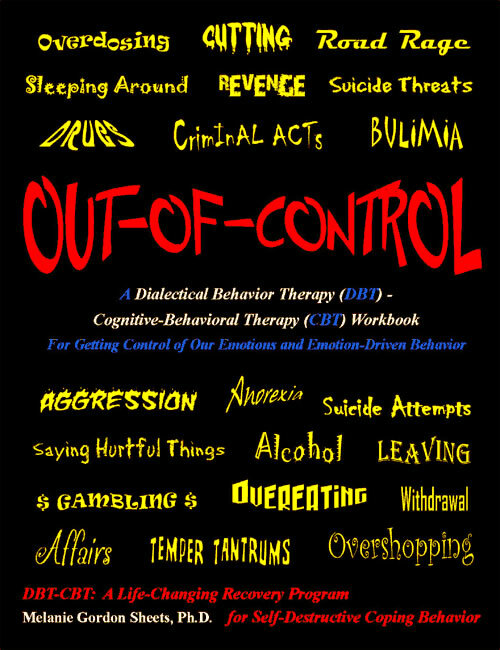 DBT-CBT addresses the six major problem areas below. Examples of the types of problems we might have in each area are also noted. This workbook is designed to meet the needs of people who suffer from problems in SOME or ALL of the six areas. Please see the "List of Common Self-Destructive Coping Behaviors" above. Doing Things on a Whim / Making "Snap Judgments"
This section helps us to understand our Emotional Mind and our Emotion-Driven Behavior. It explains why we become so overwhelmed with our emotions...and what happens when we act on an out-of-control Emotional Mind. The process of relapse and recovery is also addressed with the focus on challenging self-sabotaging Emotion-Driven beliefs like "Why try, everything gets screwed up anyway?," "Why change, nothing ever changes?," and, "What's going good today won't last." This section ends with a discussion of the importance of "Mindfully Protecting Our Peace and Stability" and finding ways to limit and manage the upsetting things in our life. Several thought control and boundary setting coping skills are practiced to help us gain control over our upsetting emotions, experiences, and thinking patterns. In Chapter 1, “The Nature of the Problem,” we looked at why our life ends up like a train wreck…full of problems and loss…with everything precious to us strewn about like the debris of a train wreck. We looked at what causes our life to blow up right in front of our eyes. We learned that "The Nature of the Problem" is…THE THINGS WE DO TO FEEL BETTER END UP CAUSING US MORE LIFE PROBLEMS. We feel worse because of the painful consequences of our Destructive Coping Behaviors. When we feel worse, we do our preferred Emotion-Driven Coping Behaviors again…and we end up with EVEN MORE consequences and losses. The result…we feel WORSE. This is THE CYCLE OF SUFFERING. As this cycle runs its course, we feel worse and worse and the CONSEQUENCES of our coping behaviors become more and more severe. The losses and problems in our life become more intense and widespread UNTIL EVERYTHING WE LOVE AND CHERISH IS LOST, DESTROYED, OR FILLED WITH CONFLICT. In Chapter 2, “The Big Picture of My Life,” we identified the most precious and important things in our life. These are the things that give our life meaning…and bring joy and satisfaction. We saw how the consequences of Emotion-Driven Coping Behavior lead to problems in some areas of our life. Then, like a Domino Effect, these problems cause problems in other areas of our life…and so on. This goes on until the Big Picture of Our Life is overtaken by problems, losses, emptiness, and pain. In Chapter 3, “The Pathways of Recovery,” we rationally challenged “WHY TRY? THINGS WILL GET SCREWED UP ANYWAY.” We determined that MANY GOOD THINGS HAPPEN in our life WHEN WE’RE ON THE RECOVERY PATH. It’s when we relapse into Emotion-Driven Coping Behavior that life takes a turn for the worst… and many bad things begin to happen again. We noted that bad things happen to all of us and it doesn’t matter how good or self-disciplined we are, bad things and difficult times WILL Come Our Way. We learned that when we’re faced with a difficult situation, we have TWO CHOICES. One is TO STAND and face our troubles and to Fight to stay on the Recovery Path. The other is to relapse into Destructive Coping Behavior. WHY TRY? WHEN WE TRY good things happen…and when we KEEP TRYING, we GET THROUGH tough times and good things CONTINUE to happen. In the Mindfulness Chapters, 4 and 5, “Mindfully Protecting My Peace and Stability” and “Mindfulness Is a Skill,” we learned that many of our problems are caused by mindless and impulsive behavior. We learned that MINDFULNESS IS THE FIRST STEP IN GAINING CONTROL over our life. Mindfulness is awareness in the “here-and-now” moment. It’s awareness of our thoughts and feelings and the reality of our troubling situations. It’s awareness of what we’re doing, what we’re thinking about doing, and how our behavior will affect the Big Picture of Our Life and our life goals. We also learned about MINDFULLY PROTECTING OUR PEACE AND STABILITY and the importance of being Mindful and dealing with the things Coming At Us. We learned Mindfulness is a skill that requires lots of practice. The first section of this workbook answered, “WHY is my life SO TROUBLED?” and “HOW has my life become SO OUT-OF-CONTROL?” We learned that it’s because of the THINGS WE DO IN THE HEAT-OF-THE-MOMENT! We went through some VERY penetrating and painful material to gain this understanding. We had to look at and process some very difficult things. However, this is PAIN FOR GAIN. This is a very therapeutic type of pain that will help to END OUR SUFFERING and bring PEACE, STABILITY, and SATISFACTION to our life. This transformation DOESN’T HAPPEN OVER NIGHT, it COMES TO US as we make our way along the RECOVERY PATH. In Section Two, we discussed the three mind states in detail (Emotional Mind, Rational Mind, and Wise Mind). We focused on how to use Rational Mind and Wise Mind to GET CONTROL of an OUT-OF-CONTROL Emotional Mind...and how to GET CONTROL of OUR LIFE! In Chapter 6, “Emotional Mind,” the two parts of Emotional Mind were discussed in detail. We gained more information about our Raw Emotions and Emotion-Driven Thoughts. We also discussed several common Emotional Mind experiences which are fueled by intense emotions and irrational thoughts. Some of these included LOVE AT FIRST SIGHT, CRASH N’ BURN DIETING, PANIC ATTACKS, and ENABLING. We also reviewed some positive aspects of Emotional Mind. In addition, we gained insight into HOW WE COME TO BELIEVE the abusive and hurtful statements people say about us. We determined that these statements are EMOTION-DRIVEN LIES which say more about the speaker than us. We also discussed ways to control painful RUMINATION and ways to REQUEST TIME-OUT…so we can COOL OFF IN THE HEAT-OF-THE-MOMENT and gain control over our Emotional Mind. “I CAN’T STAND TO BE ALONE.”, "I CAN'T DEAL WITH IT. ", “JUST ONE DRINK DOESN'T MATTER.”, “I’M SO FAT, NO ONE WOULD WANT ME.”, and “KILLING MYSELF WOULD MAKE LIFE EASIER FOR MY FAMILY.” Focus was also given to the LIES we tell ourselves about SUCCESS and FAILURE and the irrational nature of ALL-OR-NONE thinking. We also identified emotional and physical states which make Turning On Rational Mind more of a challenge. TO STAY ON THE RECOVERY PATH OR TO RELAPSE. He initially chose Relapse Route. We witnessed how he rationally and wisely WORKED THROUGH his relapse and STEPPED RIGHT BACK ON THE RECOVERY PATH! In Chapter 8, “Challenging Extreme Judgments,” we explored the destructive nature of Extreme Judgments. We took a close look at the effect OUR Extreme Judgments have on OURSELVES and OTHERS… and the effect OTHER PEOPLE’S Extreme Judgments have on US. We determined that Extreme Judgments often become Self-Fulfilling Prophecies. This means that WE tend to become what WE CONSIDER OURSELVES to be…and OUR PEOPLE tend to become what WE CONSIDER THEM to be…and WE tend to become what OTHERS CONSIDER US to be. We also worked with “The Challenging Negative Judgments of Me Worksheet” and rationally challenged the negative judgments made of us. We PROVED these to be EMOTION-DRIVEN LIES. We determined that these labels have little or nothing to do with us, but SPEAK VOLUMES about the emotional issues of the speaker. We also noted the difference between our BEHAVIOR and our CHARACTER. We saw that “Stupid ISN’T as stupid does.” We learned we’re NOT STUPID because we do foolish things. We learned WE HAVE GOOD JUDGMENT…but, we don’t ALWAYS act on it! When we’re dysregulated and Out-of-Control, we don’t control ourselves and we act in ways we KNOW are NOT in our best interests. It’s not an issue of intelligence, it’s an issue of impulse control! In Chapters 9 and 10, “Wise Mind” and “The Wise Mind Worksheet,” we learned about Wise Mind and two tools for getting to Wise Mind. We learned that when we use BOTH Emotional Mind and Rational Mind to deal with a situation, WISE MIND TURNS ON. Wise Mind is respectful of our EMOTIONAL ISSUES and CONCERNS and WHO WE ARE AS A PERSON…as well as the TRUTH and REALITY of the situation AND the Big Picture of Our Life. Wise Mind leads us to WISE UNDERSTANDINGS and a GAME PLAN for dealing with our situation. Wise Mind urges us to ACT IN OUR BEST INTERESTS and to gain and MAINTAIN PEACE AND STABILITY. We discussed that Wise Mind is ACTION-ORIENTED since there isn’t anything wise about NOT Following Through with what We Know to do! "THE WELL ANALOGY WORKSHEET” and “THE WISE MIND WORKSHEET” were discussed in detail in these two chapters. These are Mindfulness tools that help us to THINK THROUGH BEFORE WE DO and to TALK OURSELVES THROUGH the Heat-of-the-Moment. The story, “Drew Got Dumped,” was used as an example of how to TALK OURSELVES DOWN the Wise Mind Well…out of some very desperate and aggressive impulses…and INTO Wise Mind. We also worked with Drew’s story to learn how to complete a Wise Mind Worksheet. In these Wise Mind chapters, we also discussed “Six Tips for Participating Wisely and Effectively.” Some of these included STOPPING OURSELVES from carrying-out destructive behavior, PLAYING BY THE RULES, and DOING WHAT WE NEED TO DO WHETHER OR NOT WE LIKE IT OR WANT TO! We also addressed FOLLOWING OUR HEAD OR OUR HEART, CARRY-OVER EMOTIONS, and how there’s AN ORDER TO THINGS such that Rational Mind must be Turned On before we’ll accept Wise Mind suggestions for problem-solving and coping. The ways of “THE GOOD COUNSELOR” and the importance of LISTENING TO THE VOICE OF WISDOM were also discussed. Through the second section of the workbook, we learned that when we’re Big-Time in Emotional Mind, we often do desperate things to relieve the emotional pressure so we can return ourselves to a more comfortable emotional state. If we allow Emotional Mind to “run its' course,” we often end up acting in IMPULSIVE and DESTRUCTIVE ways. We must STOP OURSELVES and Turn On Rational Mind and Wise Mind to manage our emotional state. That’s the only way to TAME A RECKLESS and OUT-OF-CONTROL Emotional Mind. That’s the only way to GAIN CONTROL of our life and our life outcomes. That’s the only way to Mindfully Protect Our Peace and Stability and the Big Picture of Our Life. If we don’t STOP OURSELVES, our Out-of-Control behavior WILL destroy us and everything that’s important to us. This section focused on how to accept and deal with the difficult things in our life...and how to set-up and live a RECOVERY LIFESTYLE. and Game Plans for recovery were discussed. In Chapters 11 and 12, we discussed the process of healing and recovery and how it involves Distress Tolerance and Acceptance. We learned that we must ACCEPT that pain and distress is a NORMAL part of life. We must LEAN INTO and do…whatever we have to do…to WORK THROUGH our pain and problems…so we can GET THROUGH them. We must use Distress Tolerance skills FOR AS LONG AS IT TAKES for our changes to Take Root…for the distress to subside…and the benefits of our changes to be fully experienced. We must be WILLING to feel worse for awhile so we can feel better down the road. We have a CHOICE to Go Through the TEMPORARY PAIN of dealing with our problems and losses…or the LONG-TERM PAIN and SUFFERING of avoiding and stuffing them…and carrying them throughout our life. We learned to use the skill of Radical Acceptance TO ACCEPT the things that AREN’T ACCEPTABLE. We must accept things even if it’s not right or fair that we have to…because NON-ACCEPTANCE will keep us STUCK IN PAIN and NEGATIVITY. We also learned that we can EMOTIONALLY STEP BACK from “unchanging situations” and still try to make changes…AS LONG AS WE CAN BE OKAY while doing so. If we can’t be okay, we’ll have to Step Out of the situation because we MUST protect our peace and stability. We also discussed “The Baseball Analogy of Life” and how our job is to go up to bat…and DO OUR BEST to hit the balls Coming At Us. Our job is to use Wise Mind to make the best play possible EACH TIME we’re at bat and to use Distress Tolerance to keep ourselves in play during the toughest games and seasons. In Chapter 13, "Life-Enhancing Coping Skills," we learned that we often choose Self-Destructive Coping Behaviors because they’re Tried N’ True, fun and exciting…they Numb-Out our emotions and White-Out our thoughts…and they give us QUICK RELIEF. We learned that when we use Life-Enhancing Coping Skills, we’ll have to use Distress Tolerance skills, too. That’s because Life-Enhancing Coping Skills REDUCE our pain and distress and LOWER our Emotional Intensity Level…but they DON’T WIPE-OUT our pain and distress FOR LONG PERIODS of time. We must ACCEPT and LEARN TO TOLERATE the distress of STILL HAVING SOME painful feelings and upsetting thoughts. We learned to use “The Levels of Emotion Chart” to gain information about our emotional levels. We discussed that we ought to seek help when our emotional level is at a 5 or 6…while we HAVE ENOUGH Rational Mind going on that we CAN BENEFIT from help WITHOUT being institutionalized…and BEFORE we slip too much and cause ourselves extra problems…and BEFORE things get OUT-OF-CONTROL. We also completed “The Life-Enhancing Coping Activities Worksheet” and listed many positive coping activities that we WILL DO to reduce our emotional intensity. We learned to use an “Activity Calendar” to give ourselves many coping options in the Heat-of-the-Moment…when we really need support and distraction. We also learned how to use a “Weekly Calendar” to set up a busy Recovery Lifestyle. In Chapter 14, "The Game Plan,"we learned how to write-up and use a "Game Plan." We identified the Wise Mind Action Steps that are critical to our recovery. We learned how we sabotage our recovery with Emotional Mind Excuses and Rational Mind Obstacles. We learned to use Rational Mind Challenges and Wise Mind How-To’s…to get passed and around the obstacles and excuses that are roadblocks…and get in our way on the Recovery Path. The text boxes below contain the other text on the back cover. the things we do to feel better end up causing us to feel worse. Our lives spiral OUT-OF-CONTROL and into a CYCLE OF SUFFERING. This book is about what we do in the heat-of-the-moment…the emotional moment. It’s about what happens when EMOTIONAL MIND drives and RATIONAL MIND takes a backseat …and WISE MIND is left on the side of the road. 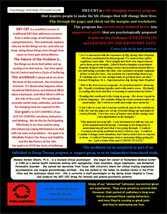 or Group Therapy program, a support group, or as an independent home-based study. Melanie Gordon Sheets, Ph.D., is a licensed clinical psychologist. She began her career at Richardson Medical Center in 1985 as a mental health technician working with Agoraphobia, Panic Disorder, Major Depression, and Borderline Personality Disorder. She earned her doctorate from Texas A&M University where her clinical training emphasized psychoanalytic and Jungian psychotherapy methods. She has worked at the Dallas VA Medical Center in the PTSD Clinic and the Substance Abuse Unit. She is currently a staff psychologist at Big Spring State Hospital in Texas and conducts the DBT-CBT Group for forensic and general psychiatric patients. Many of our "abnormal" behaviors are normal given our experiences. They once served as survival skills. However, their period of usefulness is long over. We've overused these coping behaviors...and now, they're causing us great pain and they're destroying our lives.